With business diagram maker you can draw business diagram like arrow, basic flowchart, fishbone, circle-spoke, fault tree analysis, EPC, pyramid and TQM diagram, etc. Business diagrams include arrows, audit, basic flowchart, brainstorming, business matrix, circular, EPC, fault tree analysis, five forces, lists, marketing, relationship matrix, PEST, process steps, pyramid, six sigma matrix, workflow, tqm, value chain, value stream mapping and Venn diagram. First, open Edraw Max, then point to "New", then choose "Business Diagram". 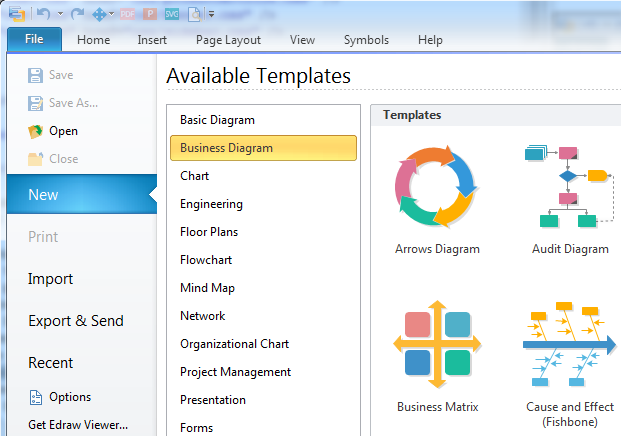 As you can see, there are lots of business diagram templates in Edraw Max. When you click the business diagram templates, you may find that there are examples at the lower part of the software. Double click the example, then you will open it. You may customize and edit the example as you like, which will definitely save you plenty of time. You can drag and drop the arrows shapes you like from the library which is on the left of the canvas. On the upper right of the arrow shape you have chosen, you may find a floating button from which you can set segment number, add or delete a segment. And you can get the angled text from the last option on the floating button. You can drag and drop the mind map shapes you like from the library which is on the left of the canvas. On the lower right of the "Main Idea" shape you may find a square button, click it once you may add the one more "Main Topic" branch. Also, on the lower left of the each "Main Topic" shape, you may find a square button, click it once you may add the one more "Sub Topic" branch. Notes: you may find a round button on the square button, click it and the sub branch(es) will disappear. Of course one more click and the sub branch(es) will appear again. Just drag and drop the marketing diagram shapes you like from the library which is on the left of the canvas. On the upper right of the "Step 1" of the "Steps Process" shape you may find a floating button from which you can add or delete a step, invert or hide arrow. On the center circle of circle-spoke diagram you may find a floating button, from which you may set circle number, add or delete a circle. Simply drag and drop the process steps diagram shapes you like from the library which is on the left of the canvas. On the upper right of the first step of "Steps Process" shape you may find a floating button from which you can add or delete a step, set arrow number, invert arrow and change shape style. Also, on the upper right of the process shape you may find the floating button too, from which you can add or delete a step and set zoom size. Notes: you may find the floating buttons on each of three chevron shapes. You may drag and drop the pyramid chart shapes you like from the library which is on the left of the canvas. On the upper right of the pyramid shape you have chosen, you may find a floating button from which you can set set level number, add or delete a level. You may drag and drop the six sigma shapes you like from the library which is on the left of the canvas. On the upper right of the six sigma shape you have chosen, you may find a floating button from which you can set set add or delete a row, set row number, add or delete a column, set column number.